Kathryn Gustafson's water feature is "highly accessible"
"Inclusiveness and interactivity" are the key themes of a dramatic oval fountain commissioned to commemorate Princess Diana. The �3m football pitch-sized permanent memorial will be a contemporary fountain to remember a "contemporary princess", says its designer Kathryn Gustafson. One side of the fountain will see water bubbling down a gentle slope, while the other stream will tumble and cascade before both paths flow into a tranquil pool. The design details were revealed on Friday, following an announcement in July that American landscape artist Gustafson has won the prestigious commission. Gustafson said the contrasting halves would reflect the different parts of the princess's life - the joyous times but also the turmoil she experienced. Work on the ring-shaped stone fountain, to be built to the south of the Serpentine in London's Hyde Park, is set to begin next year and is expected to be finished by summer 2004. 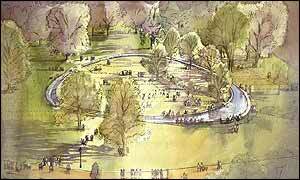 The Royal Parks will submit details to Westminster Council for planning permission for the 50x80 metre fountain next week. Gustafson said: "The concept is based upon the qualities of the Princess that were the most loved and cherished. These were inclusiveness and accessibility. "It is an environment that you can walk into, be part of. "It is a large oval, the size of a football pitch, that is a novel use of water, that is brilliant in the sunlight, that cascades down, that you can touch and you can be interactive with and that you can become part of." The designer said they wanted to create an environment in which people could remember Diana and "not an icon that they can only look at". She said: "The fountain also reflects parts of the Princess's life - on one side the water bubbles and effervesces down a gentle slope, whereas on the other side it tumbles down, cascades, then 'rocks and rolls' from side to side in a joyous way, before turning over on itself, perhaps representing the turmoil in her life. "Both sides finally flow into a tranquil, peaceful, calm pool." Water will enter the fountain at the highest point of the sloped design, tumbling downhill in two directions. Down the east side, the water will flow down steps where water jets will make the stream bounce and jump. The water will then enter an area carved so the water gently rolls along a subtle curve just before a dry crossing point for people to enter the centre of the fountain oval. After the crossing, the water will pick up momentum before entering a sharp curve and ending up in a large, calm pool. In contrast, the west side of the fountain sees the water gently bubbling along a narrow channel with subtle jets. As it continues towards the pool at the end, the channel widens until a tumbling cascade of white water falls over a waterfall. Both sides of the fountain spill into a reflective basin at the lowest point, where special texturing will make the surface of the water come alive.